Another thing I enjoy about street art is the conversations that artists have. Call it public (illegal) discourse. 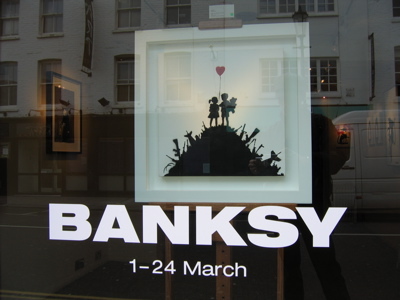 At the Andipa Gallery in a swanky part of London, Banksy had a show on the walls. The gallery had £50,000 price tags on some of the stencils-on-canvas, making me laugh once again and think, “who is screwing who? 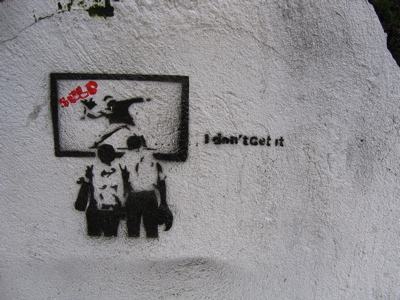 !” I had no idea that simple stencil pieces could sell for that much, and am now convinced that the medium is officially mainstream. 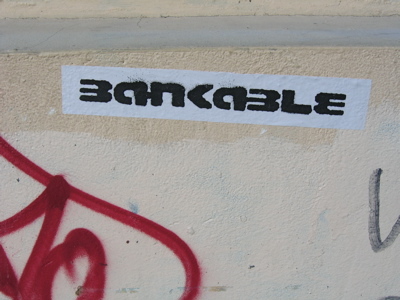 On the street, other artists are discussing the capitalization of Banksy’s art as well as taking a humorous look at his deeper meanings. Found these in different parts of the East End. 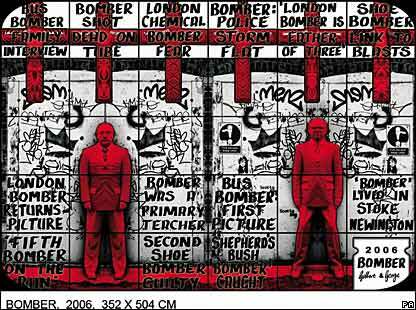 Reuse and conversation themes continue via Gilbert and George’s 2006 “Bomber” piece. They had a retrospective up at the Tate Modern, with a hallway of pieces they had just created as a comment to the London terrorist bombings. Bomber has a double meaning: it can be a graffiti writer or a person who blows things up. 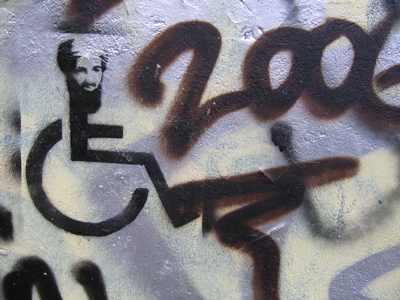 So they reused some local tags in this piece, one of them a humorous Osama Bin Laden stencil. 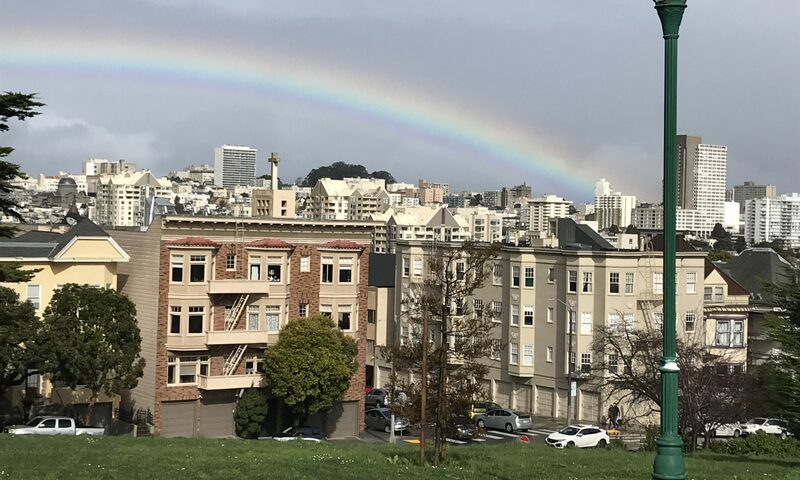 Below is the original that I found on my wanderings. 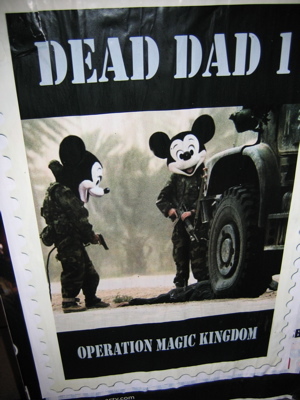 There are a few more stencils in the G&G piece if you look hard enough. So apologies if you where expecting the Millenium Wheel, Tower Bridge, Parliament, etc. Once I get Laura’s batch, there might be some more to add, but she doesn’t take normal travel photos either. Next photo installment will be Cairo, with painstakingly framed shots of tourist attractions that try to avoid people (almost impossible in a city of 20-25 million)!